Barnesville Ohio Insurance | W.D. 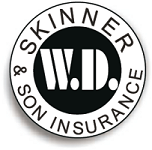 Skinner & Son Insurance Agency for Auto, Home, Life, Health, Business and more. Welcome to our Customer Service Center. We are pleased to provide you with multiple ways to communicate your service needs to us, however please note that coverage requested via email or voicemail is not bound until you have received acknowledgement from our office. I wish to proceed with my request. Take me to the Contact page instead.